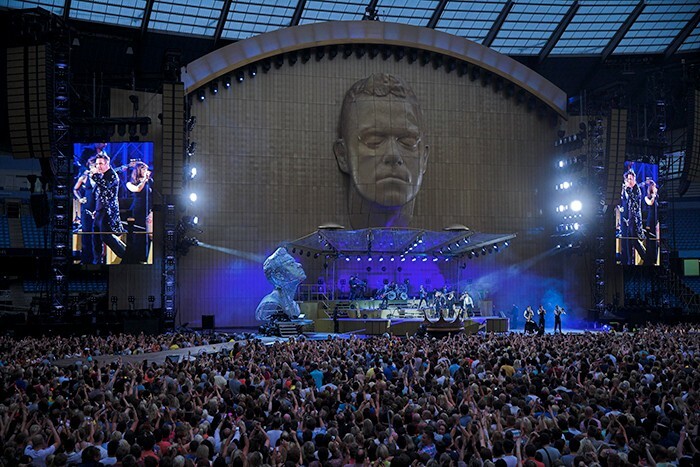 XL Video continues its long association with singer Robbie Williams, supplying over 46,000 Barco FLX-24 pixels, HD camera system, D3 control, IMAG screens and crew to the phenomenal "Take The Crown" stadium tour, which is already receiving rave reviews and putting Williams right back on his pedestal as one of the best live entertainers of his genre. The unique, edgy camera mix is being crafted by Stefaan 'Smasher' Desmedt and the jaw-dropping stage set which includes a back wall video screen and a huge video mapped scenic piece of Williams’ head, is designed by the late stage architect Mark Fisher. Artistic director and lighting designer is Willie Williams and the show’s producer is Lee Lodge. The impressive 12.6 metre high by 7.5 metre wide 3D head was modelled from a scan of Williams’ face and is fully pixel mapped. 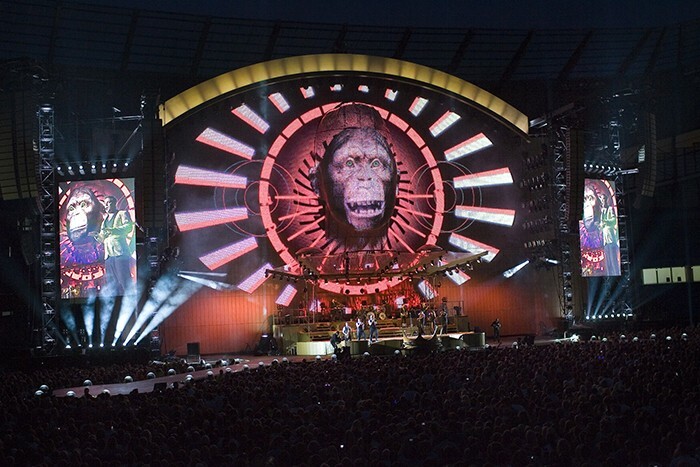 It is central to the elegant theatrical visuality of the stage, and is fitted with the 46,000 Barco FLX 24 video pixels – the same ones that featured on U2’s 360 Tour. These have been integrated by TAIT who built the head. The fibreglass set piece has a solid looking gold finish, similar to that of the back video wall. It’s a complete surprise when it bursts into life with video! The head pixels were all manually drawn by Smasher using Maya software for the mapping process which is completed in the United Visual Artists (UVA) D3 server. This took around two months of intense work. As well as Ash Nehru from UVA, he worked closely with TAIT’s Fredric Opsomer, and the head itself was engineered at TAIT’s workshop in Belgium. The D3 server (running with fully redundant backup) was programmed with the pre-recorded video content by Smasher and Luke Halls from Treatment, the London based video artists commissioned to produce the various pieces. For the show it receives timecode triggers from the backline. The two portrait side IMAG screens supplied by XL Video are made up from Pixled F-11 product, each measuring 8.1 metres high by 5.4 metres wide, and XL is supplying eight Grass Valley LDK 8000 cameras. Two are hand-held covering the two stage ramps, able to move up and down, and another two hand-helds can track across the area in front of the stage. There are two more on fixed cameras on stage right and stage left and two with long lenses at FOH, complete with an additional remote Bradley CamBall2 on the drums, which is operated by Smasher. All these are fed into his GV Kayak mixer – he cuts the show from the FOH position – and the mix is sent to the D3 where it is output and fitted to the side screens. One of the keys to Smasher’s distinctive oeuvre of camera wizardry is working closely with Willie Williams’ lighting and with the spotlights in particular (called by Alex Murphy). He will choose his shots according to where certain key lighting is coming from and with reference to the spotlights. "As a director the lighting is most important. It allows me to find the right positions and make interesting and complimentary backgrounds in the process of creating beautiful overall pictures." It is a technique that he and Williams have been developing since the last U2 tour and is a constantly evolving ‘work in progress’. 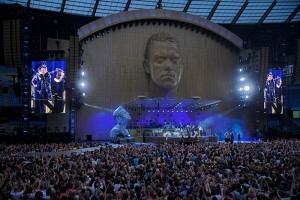 Robbie Williams is also a great live artist for any video director to work with as he enjoys playing up to the cameras. XL’s crew chief is Stu Heaney and the engineer is Myway. There are 13 video crew in total on the tour, ten from XL Video and three from TAIT (whose Pixel Tablets make up the back wall). The main challenge at each show is the scale of the operation, tightly co-ordinating the crew and the build and integrating with the other departments. They get in before lighting and after set – and have over 80 video dollies to be unloaded and rigged at each venue. Seven trucks alone are dedicated to transporting all the video elements with an eighth carrying the cameras and side screens – a substantial amount of kit for one department. Wob Roberts comments: "Once again, XL has provided us with not only the best video team I've ever worked with … but also a high spec rig for a reasonable price."